EquestrianScholar wrote: "Greeting Clockwinder, an interesting name for paladin I say," he would offer in a joking tone and a chuckle before considering the groups predicament. Onto his question Mythos would offer, "No I have not seen a tower, though I am in the area to find something of interest." Mythos didn't know about the tower, though he would consider if he remember hearing any story of one while walking to stand next to Silverhide study the trap to see if he could lend aid saying, "Perhaps I may have a go at this?" The unicorn would use his horn magic and hooves to begin messing with the trap, yet seeking to be careful as he considered different ideas. As he examines the trap, Mythos recalls reading about a similar tower in one of the many dusty history books his mother had him study. Throughout the last 100 years, a tower had been sighted in various places throughout Everglow. With its arrival, storms of great ferocity and strength would appear close behind, then dissipate after a month, the tower disappearing with it. 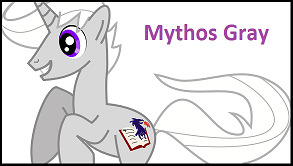 However, Mythos is not aware of much else. After about half of a minute of careful examination, Mythos realizes that the trap is only large enough to make a solitary pony fall through. Some careful prodding reveals the seams to the earthen textured mat covering the hole, and Mythos carefully removes it. Within the hole net rigged so that anyone falling in would be thoroughly entangled. Just above the net, a suspicious thin thread is held taught across the length of the hole. In the time it took for him to consider the trap and figuring out how to spring it, Mythos would say loud enough to be heard by all nearby, "When I was young, I remember hearing a story of a tower that appeared every 100 years in different parts of Everglow, always followed by a storm of great ferocity and strength... like what we are experiencing now. Of importance I feel is that this the storm and tower only sticks around for a single mouth, so the question is how long has this storm been raging?" It was near the end of these musings that the unicorn would figure out how the trap worked and smiling he would begin working to quickly and safely spring the trap as he slowly lifted earthen mat, a purple glow around his horn. When he would remove this mat he would consider the net and the thin thread across the length of the trip, cutting the thread while moving the net that would fall aside before saying, "The trap was only large enough capture a single pony, so I believe it will be safe to have the wagon go over it if we are careful." EquestrianScholar wrote: It was near the end of these musings that the unicorn would figure out how the trap worked and smiling he would begin working to quickly and safely spring the trap as he slowly lifted earthen mat, a purple glow around his horn. When he would remove this mat he would consider the net and the thin thread across the length of the trip, cutting the thread while moving the net that would fall aside before saying, "The trap was only large enough capture a single pony, so I believe it will be safe to have the wagon go over it if we are careful." A few moments after the thread is severed, a rumbling is felt though the ground. A few feet away, a previously unnoticed patch of bare dirt among the grass begins to move, shifting and churning as three bony hands begin to emerge. Seconds later, three skeleton warriors stand tall, muddied and soaked to the bone (buh dum tish). Each skeleton wields a club and hook. Meanwhile, just before the skeletons rise, Cauliflower returns from her second trek into the distance. "I quickly scouted out the cave, and everything should be---" Cauliflower stops talking and simply stares at the skeletons. They begin to move forward, but stop suddenly as they notice the party around the exposed trap. With a dead look in their eyes (buh dum tish) they raise their weapons and charge at the party. Equestrian Scholar rolled 1d20+3 and got a total of 17 (14+3) for initiative. The grey unicorn would look in surprise at the appearance of the skeletons, cursing softly under his breath and wondering if this had happened because of disarming the trap before moving behind the ponies he and just met saying, "I will try to cover you will spells, not sure what more I can offer. Though perhaps I may remember something from my research and readings." Last edited by EquestrianScholar on Tue Apr 21, 2015 3:36 pm, edited 5 times in total. Clockwinder watches in horror as skeletons rise from the ground. He immediately equips his sword and shield. "Undead!" he shouts, "Show them no mercy! For they shall provide none!" he calls out as steam vents from his body, taking a defensive stance. Grinning at the skeletons, and the words of clockwork, Black Cross prepares to use command undead, during her turn of course.